By Brian Voo in Desktop. Updated on November 14, 2017 . Everyone knows that common keyboard shortcuts not only improves your productivity but also increases your overall typing speed. 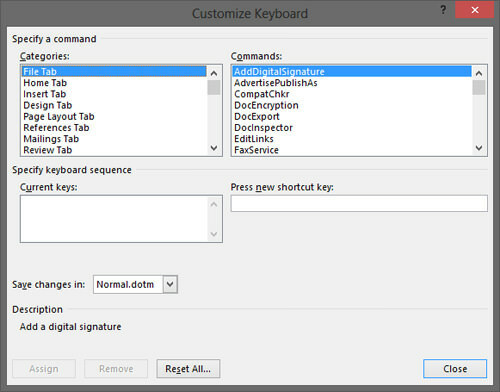 However, not all actions on Office 2013 have default keyboard shortcuts, some of these common actions include, changing font color or size and strikethrough text. It would be fun to have shortcuts for these actions though especially when you have to do them over and over and over again. 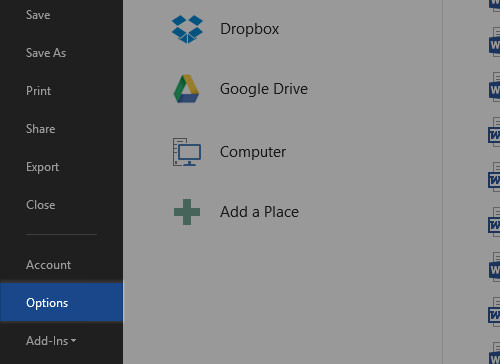 In this post, we’ll show you how to assign shortcuts to these actions. This trick we are showing you works for almost all commands you can find on Office 2013, namely Word, PowerPoint and Excel, the more common Office products. Out of the 3 Office products we’ll be featuring here, only Word has the option to use custom keyboard combinations to trigger an action. Keys that we suggest to use would be a combination of Ctrl, Shift and Alt followed by a letter. 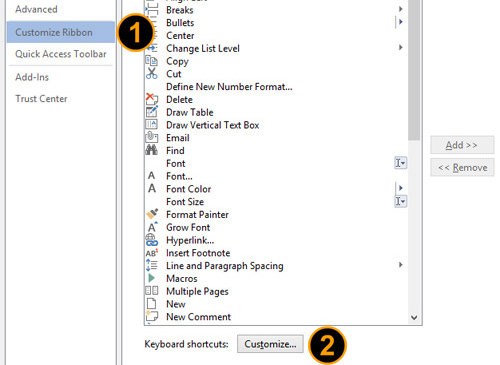 Start Word 2013 and navigate to the Options section by clicking on File > Options. 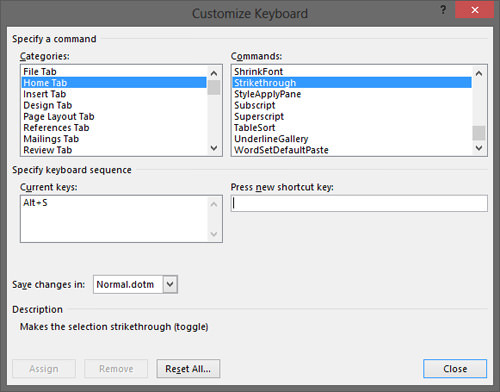 Then navigate to Customize Ribbon and you’ll find ‘Keyboard shortcuts’; click on the Customize button next to it. Let’s first explain the things you see on this new window that pops up. Commands are the actions you normally do on Word, for example Bold and Italics. These commands are in Categories based on the tabs in Word, e.g. the ‘Home’ tab or ‘Page Layout tab. This arrangement means you’ll easily find the command you want to customize as a keyboard shortcut. We’ll now demonstrate how to add a keyboard shortcut to the Strikethrough command on Word. You’ll notice there is no shortcut key for Strikethrough — the ‘Current keys’ box is empty. 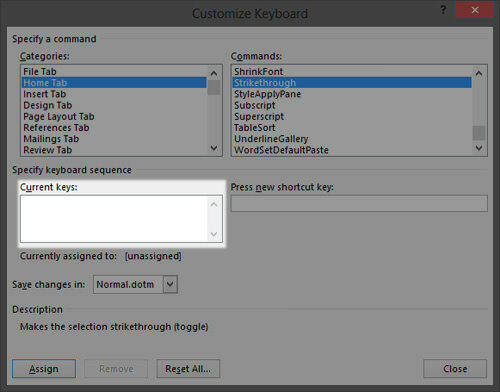 Click on the ‘Press new shortcut key‘ box and personalize a keyboard combination shortcut. In this case, we used Alt + S.
You can see that the combination Alt + S is not taken because it’s unassigned. This is important as you do not want to double assign a combination. After that click on Assign. You can see all the assigned shortcuts you have for each command in the ‘Current keys’ box. If it is empty that means you have yet to assign a shortcut to the command. Click Close when you’re done. Now whenever you highlight text with your mouse, you can press Alt + S to Strikethrough it. Again, this is not just limited to Strikethrough but any command you set with a keyboard shortcut combination. There are some limitations creating shortcuts on PowerPoint and Excel as you don’t get as much flexibility compared to Word. However, adding keyboard shortcuts is simpler for both PowerPoint and Excel. Let’s use the example of the AutoSum button. When you need the values of certain fields added up together, you use the AutoSum function. It’s handy to have a keyboard shortcut assigned to that if you are doing your bookkeeping, for instance. 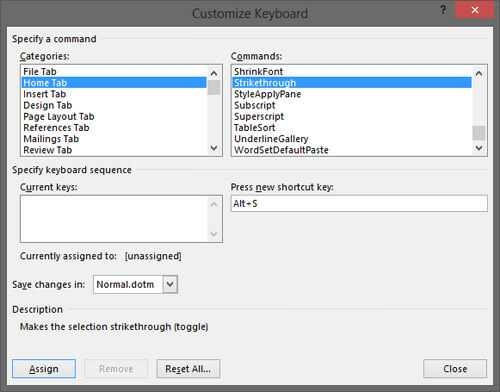 To add a keyboard shortcut to AutoSum, right-click on it and select ‘Add to Quick Access Toolba’r. It’ll be added to the top left corner of Excel, in the same row as the ‘Save’ and ‘Undo’ icons. To activate this shortcut, all you have to do is hit the Alt key on your keyboard. You’ll see a number corresponding to the shortcut, in this case it’s the number 4 that activates the AutoSum command. You can do the same thing to any other command or action you need to use on both PowerPoint and Excel (this also works for Word). Just right click on the button and Add it to Quick Access Toolbar.